That is the way my husband and I live our lives. If we didn’t have the money we didn’t buy and we saved to buy. I figured we saved thousands over the years by doing that. We are now in out late 50’s and live comfortable. Our home is paid for we have a boat, travel trailer, a classec car, husband owns a goldwing and we have enough money in the bank to live comfortable the rest of our lives. We have kids that have been good not into drugs or drinking. They never had name brand stuff I refused to buy clothes to advertise for the designers. If they wanted to go on a class trip I always made them work to pay their half of the bill. They don’t have the attitude that everyone owns them a living like a lot of kids do today. I taught them to shop the sales and they still do. There kids don’t have cell phones and are not into drugs. They appreciate everything given to them. My friend’s kids treat her like dirt and are constantly wanting money and if they don’t get it they refuse to let her see her Granddaughter. Would I do it again yes. I don’t need designer purses, shoes or clothing I don’t have to have the best of everything I just want to be able to travel and enjoy our country and we do. Good for you. This is how we are raising our kids also. Although my kids are still little (6, 2.5 and a 1 week old baby), I hope I could be writing those same words in 30 years. Funny that someone would email you that question. I wonder if anyone would ask someone who lives a lavish lifestyle if they would regret that. We are such selfish creatures by nature. I think you and your husband are admirable and blessed to have discovered the truth that many find way to late in their lives to do much about. You can never out give God. I’m sure He will continue to bless your family thereby blessing others. If you read the original article, you might have seen my response to her answering this question. I’m the one who asked this, but in no way was it to take away from what they’ve done. My family is struggling as we try to live debt free with very little coming in. It’s hard to stay on track when we see others with so much more. We want to be able to treat ourselves and have fun, but then guilt kicks in and we change our minds. My question was intended differently than most took it. I simply wanted to know if Crystal and her family felt like all the things they didn’t get to do were worth the sacrificing. At the time I asked this, it wasn’t worth it for our family. We never did anything but save money. My marriage was literally suffering. Now, I’ve rationalized that we have to have a life too. Yes, we intend on helping others, but we’ve done that so much before, right now we feel like it’s time to focus on ourselves. Some would call that selfish, but we think it’s smart. You have to take care of yourself before you can help anyone else. Otherwise, you won’t be able to help anyone. And for the record, I have asked several people who live differently. They all feel the same as Crystals readers. The good times with their families were worth the financial struggle. I’m sure this is within reason though. The main point is that you have to have a balance. You can’t blow every dime and you can’t save every penny. I liked this post the best from this series! It again reminded me of the more important things in life. Although I would love to go on a shopping spree or two……. showing the love of Jesus through giving is the most fulfilling. The only regret I have for being frugal is that it takes up a lot of time. This does bother me because life is short. With increasing globalization, I think it’s important to remember that our frugal choices have positive ripple effects not only around our own homes and lives but around the world, too. 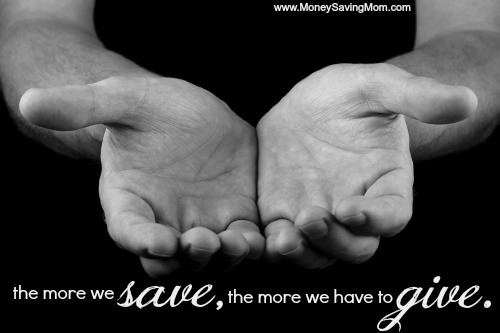 I love the motto “the more we save, the more we have to give”. I think I am going to add that one to my inspirational quotes wall at work. I think this is why I LOVE this blog so, we think and do alike. I am older than you and wished I had this more in my heart years ago, but we are blessed beyond measure. People think we are weird because we don’t spend(blow) what we have. Everything we have is paid for mortgage, van,truck,tractors, livestock, and pets. People say why don’t you go on vacation? Living the way that we do is a vacation. Our daughters have grown up knowing the Lord and knowing how hard we work and give way. They are good, they only shop at thrift stores, and are frugal givers also. We are anticipating the birth of our 2nd grandson. It would be easy to spoil them but we are teaching them the same lessons. Like you stated it is not about upgrading our life style it is about giving more. Thank you sooo much!! Do more in 2013!!! Where are the deals? You hardly post any deals anymore. I love this post. Absolutely. In my own life, I save money so that I can give myself, my time and my focus to my family (dh & 6 kids 13 and under). My husband brings in the income and I stretch it as far as I can. A few years ago I was given a few years to live. The Lord is good; He has healed me, and it’s lookin’ like I get some more time. But this health crisis forced me to look at what matters in life. And for me, at this point in my life, it is investing in my children. Not in giving them things, but how I give my time to them. Being frugal does not need to take a ton of time. I probably spend 3-4 hours throughout a week, and it helps me do what I value. I have no regrets about this at all. I think this is great. I love the phrase, “we should live simply so others can simply live”, and “we want to live below our means so that we can give generously to others.” This whole topic brings up an ongoing discussion between my husband and I though. My husband and I are both frugal, and we save a lot. Our difference is, that my husband wants to save more for retirement than I think we should. 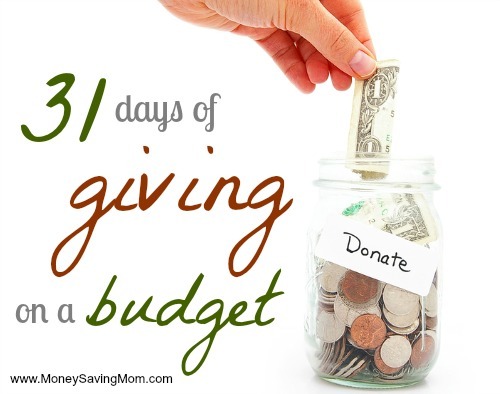 I’d rather be giving more, or at least saving some of the money we put in IRA’s in an account instead of maxing out both our IRAs, so that we have the option of giving. It’s not that we don’t give at all . . . we do give, but . . hopefully you know what I mean. I’m wondering what everyone’s thoughts are and if any other couples have experienced a similar situation in trying to understand what is reasonable to save for retirement in our age versus having money available to give. I love this and completely agree. I often tell people that living on a budget allows us to give and to save in a way we wouldn’t be able to otherwise. It is such a blessing to be able to give and I believe it leads to great contentment! Being frugal also helps you to weigh every purchase, so that, when you spend money, you truly feel satisfied and enjoy your item or experience!